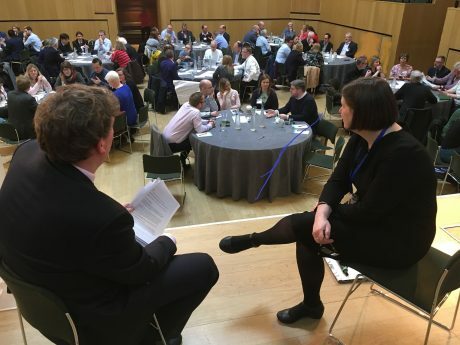 This March, the Department of Education (DfE) was invited to lead on discussions about the proposed refresh of the National Plan for Music Education at Music Mark’s Spring Summit, as well as hear from Music Hubs on current practice and key issues. Whilst the DfE confirmed the Plan would be “refreshed” earlier this year, current policy and funding officially ends in 2020 and what lies ahead has yet to be outlined, or any funding commitment confirmed. Music Mark is lobbying for continued funding and support of Music Hubs as a central part of the government’s articulated commitment to music education. For the Spring Summit, Music Mark invited its member Music Education Hub Leads and Services to network and share practice, as well as consider what a refreshed National Plan for Music Education should look like. Presentations on the current Plan’s 4 core roles and how they have evolved over the past 7 years opened up the day, exposing how much has changed since the Plan was published in 2011. Hubs have developed and fine-tuned Whole Class Ensemble Teaching (WCET); Singing Strategies; Progression routes and how to provide Ensembles/Groups, based on local demand and needs and their commitment to greater inclusion and equity of access for all children and young people. The DfE’s Senior Policy Advisor David Warden was then invited to present, and as the one of the key civil servants who will be leading on the refresh, he was able to deliver some key messages from the DfE, as well as take note of the key issues and questions raised by Hubs on the day. Mr Warden could confirm that the DfE does not anticipate “any fundamental change “ to the Plan and that the DfE “ is clear that music is a vitally important subject, and […] want(s) all pupils to study it at least up to the age of 14”. He also confirmed “it is the responsibility of schools to deliver the music curriculum and, though you (hubs) can support them to do that, there should be no confusion around that”. Mr Warden also mentioned the DfE was “indebted to organisations such as Music Mark who have undertaken work to inform the refresh”, referring to in particular the 2018 Member Consultation.. The questions then posed to David Warden and comments that arose in the roundtable discussions afterwards can be viewed HERE. David Warden and Music Mark CEO Bridget Whyte wait for comments from the roundtable discussions. Early Years Music Provision was also discussed as part of the Spring Summit and after lunch, MERYC-ENGLAND lead the debate, asking delegates to consider the What, Why and How of Early Years Music Education? During their session, which included presentations from Nicola Burke and Stuart Whatmore from Tri-Borough Music Education Hub; Jane Parker from Take Art; Jessica Pitt from Royal College of Music; Dr Susan Young from the University of Roehampton and Vanessa Stansall from Creative Futures, ideas for good practice and successful stories were shared, alongside concerns around teaching staff lacking adequate training and pay. As Early Years was not included in the first National Plan for Music Education, data on provision and impact has not been collated and good practice is being missed. The panel also detailed the differences in practice with Early Years provision, stressing there was “a focus more on process rather than the end result”, and how often due to the young age of the music students, parents’ needs have to be accommodated too. David Warden from the DfE took note of the panel’s recommendations but was unable to confirm whether Early Years would be included in the Plan’s refresh. Music Mark will keep its members and the wider sector informed once further announcements are made concerning the Plan’s refresh, as well as continue to facilitate extended consultation. “I believe society today understands the importance of music, but some people have a generalised view of the benefits, as some are still not giving the subject the significance it deserves. In modern education, there is a large emphasis on passing English, Science and Maths. This is going to immediately highlight the importance of these subjects and create an imbalance, which favours the core subjects over the arts. Some students may overlook subjects like music, as they need to pass the core subjects to get into college. I would like music education to be more encouraged in the school curriculum and for it not to be deemed as an added extra. For instance, my instrumental lessons at Secondary School were during school time and I can remember clearly some teachers being unhappy about me leaving to go for my lesson. In the end it got to the extent that I would aim to time my lesson over my morning break, so that I would miss less school time. Why should my instrumental lessons be deemed as less important than the rest of my school academic studies? It was not until I started studying music at A level that I felt I entered a capacity where music was seen as a serious subject.